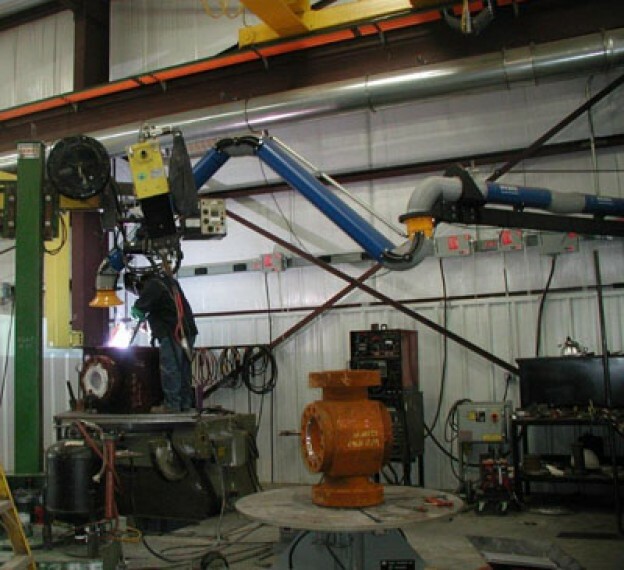 Horn Equipment, located in Moore, OK, is a well trusted and respected oil field fabrication and service company specializing in blowout preventers and valves. They provide repair services, field service, sales, rentals, machining services, and welding services. Horn Equipment contacted Avani Environmental Intl., Inc.® for a solution to welding fumes for their manual welding stations. After adding on to their facility for a new welding shop with overhead crane it was time to install and implement a cost-effective and high-performance solution that would meet their current and future needs for ventilation of welding & grinding stations. Avani Environmental Intl., Inc.® proposed a source capture system that would remove fumes and dust from the welder's breathing zone and equally important keep their new addition clean and free from grinding debris and the "staining effect" of welding fume dust. This system had to be installed under, and around, their crane rail so it would not interfere with the work flow or production. The system proposed and selected included (10) Avani boom extensions 8"D x 10'L, (10) Avani swing arms 8"D x 10'L, (1) Avani custom welding fume collection system SDC-3-24-30HP complete with (24) flame-retardant cartridges/30HP centrifugal fan/control panel/discharge silencer, (1) Spark Eliminator mounted inline of ductwork to prevent spark entry into collector inlet, (1) LOT of pre-fabricated clamp-together ductwork, and custom installation services by Avani Environmental Intl., Inc.® installation crew. Horn Equipment is very satisified with the installation, performance, and aesthetics of the system. It allows them to protect their employees, meet federal and state regulations for welding fume exposure, and assures their customer's that they are up to date with current safety equipment and quality measures for a clean and finished product.